»In the New»TOUCH: I hope they keep in touch this time. TOUCH: I hope they keep in touch this time. TOUCH, short for the original undeniable charismatic homme(s). Ok, this group has so much messed up history, i don’t even know where to start. Not to mention that due to name being such a common word (touch) it is so difficult to find out information on them (and maybe due to the lack of it). They started off as a 7-member group in Oct 2010, debuting with the song ‘Me’. The thing about this group was that, there was much hype surrounding them as some of the members were already well-known adding on to the fact that many well-known people were involved in producing this group, including Brave Brothers. However, somehow, even with their amazing live performances and not-so-bad debut song, they missed their goal by a mile. And this is where their long history of sad stories started. After promoting their second song ‘Killin’ Me’, Da Bin (vocalist) and Min Seok(rapper) left. (Min Seok had health issues) With that, they became a 5-member group. Nevertheless, they made a comeback with their 2nd mini album ‘Too hot to handle”. Their comeback was scheduled to be on May 5th 2011 but was postponed due to one of the members having acute enteritis. The song they promoted from their 2nd mini album was ‘Rockin’ the club’ which yet again received limited commercial success. It’s bad enough that a group has to change their line-up once, but the group experienced another loss when their then leader Han Jun (talk about leadership qualities) left to purse his own solo career. He was replaced by a new member Jae Wook. And then again in April 2012, Jun Yong enlisted into the army while Young Hun left the group due to personal reasons. They were replaced with Chul Min and Kang Hyun (maknae) for their recent comeback with their song ‘Let’s walk together’. The MV is decent. 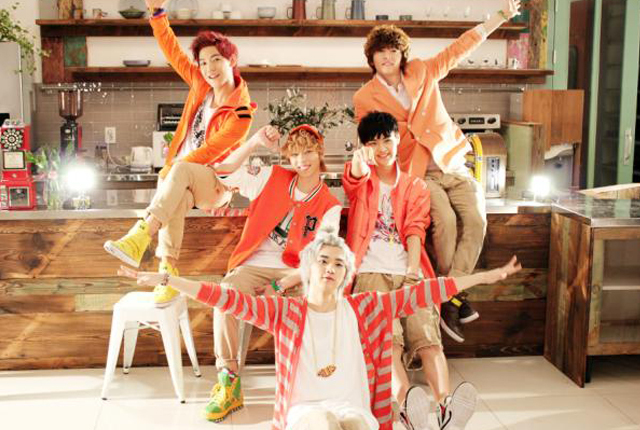 It’s quite a common style of MV where the 5 girls serenade one girl as seen in so many other MVs (e.g SHINEE – Replay). It’s a happy song (with not too much agyeo -thank goodness)and the choreography is very well suited for this type of song. In fact, i think this is one of the better choreographies i’ve seen for this kind of song. On to the song itself, it’s got the usual electronic music but instead of using it for a dance track (like they usually do), they turned it into a light-hearted song which is something different. I really like the song and for someone who doesn’t usually like happy and cutsy song, it’s saying a lot. I think this year’s line-up for TOUCH has potential. The vocalists have pretty unique voices (i am especially intrigued with Sun Woong’s voice), and the rapper (also new member and maknae) does decent rapping, not to mention his boyish looks reminds me of Yoseob from BEAST (they kind of look similar actually). Even though I really hope that they make something out of themselves this time round because i truly think they deserve a chance,especially the members who were around since debut. Think about how they must have felt when their members kept changing on top of struggling to make a name for themselves in the kpop scene. However, it is usually a very difficult task to start achieving significant commercial success after debuting for a few years with a constant change in line-up. Fans get disappointed and turned off even more if the members they liked leaves, and they have to get to know the new members again (if they even bother with the group by then) At the same time, even though their new concept is the norm for rookie groups, it is pretty much unheard of for a group that has debut to go from a manly and strong concept to a more cutsy one (like what TOUCH is doing). If it works on getting them new fans, good for them, but on the other hand, their older fans would be thrown off as they were fans because of their previous concept. I have already seen comments where fans disliked their new cutsy concept. It’s hard to say what’s install for this boy group. After going through so much, i hope for the best for the sake of the two original members.